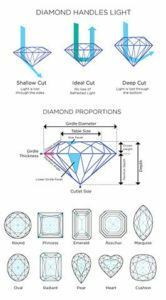 Are Diamond Cut and Shape the Same Thing? When engagement ring shoppers begin to look for the perfect diamond, they will often hear the terms cut and shape used interchangeably. However, they are in fact not synonymous. There are ten diamond shapes, including the classic round brilliant, the modern princess and the vintage-inspired cushion (see https://dominionjewelers.com/diamonds-101/cut-shape/). And although these shape descriptions are frequently followed by the word cut, that word has an entirely different meaning. A woman’s preference for a particular diamond shape is thought by many to be the most important consideration when choosing an engagement ring. If she has her heart set on a square diamond, it’s because that shape, and the setting designs that will complement it, are the best reflection of her personal taste and style. She will likely not be happy with a round or oval shape, which will have a totally different look. However, for those who opt for the most popular (for some 70% of diamond buyers) round brilliant, the cut of a diamond is arguably the single most important characteristic, and greatly influences a diamond’s value. In a well-cut diamond, light enters through the large table facet and bounces off the crown (top) and pavilion (bottom) facets, returning the reflected light back to the eye. A poorly cut diamond does not allow the light to bounce off the angles and facets inside the stone but rather causes it to “leak” through the bottom and sides of the stone, resulting in a lifeless, dull-looking diamond. Simply put, the quality of the cut, which a gem laboratory such as GIA or AGS may grade anywhere from excellent to poor, indicates how well a diamond reflects light, which in turn affects the brilliance (brightness), fire (color flashes) and scintillation (sparkle) of the stone. ← What Is a Cert, and Do I Need One?